Awesome knives, greedy! I wonder are you related to the Bokers? Your collection looks like it should have belonged to the factory itself! Thanks knifegirl888. I'm glad you liked them. Here's one with grat MOP that has been through the mill. Nice ones Ken and Lee!! Here is an old Winchester I have. A HOK but I am glad to be its caretaker. Very nice, Ken, Lee and woodwalker! 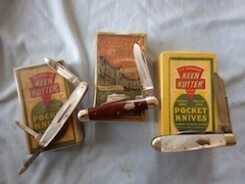 Here are most of mine, 5 Keen Kutters, 1 E.C.Simmons with a Keen Kutter etch, and a Needham Brothers REPEAt. Mighty fine lookin' knives you have there Dan!!! Hard to single one out from that crowd... but I did notice there doesn't appear to be any pins holding the abalone scales onto the Simmons / KK. You have some beautiful knives, Dan. Great showing of lobsters Dan ... That abalone KK is stunning but they are all awesome!!! Thanks for the comments Ken, Joe and Lee. Yep, there are no visible pins in the abalone. Simmons called abalone "Japanese pearl". There are 8 patterns in the 1917 catalog with Japanese pearl handles. The scans are not that great, but, there are no visible pins in any of them. The handle slabs are very thin and I am not sure how they are held on? If it is glue, it is very durable as they are firmly attached. danno50 wrote: Very nice, Ken, Lee and woodwalker! Here are most of mine, 5 Keen Kutters, 1 E.C.Simmons with a Keen Kutter etch, and a Needham Brothers REPEAt. Wow Dan!!! All those are very very nice!! Great looking knives!! Congratts!! Great old thread with lots of nice knives being posted. espn77 wrote: Great old thread with lots of nice knives being posted. Very nice ESPN77!! You take great photos of your knives! !